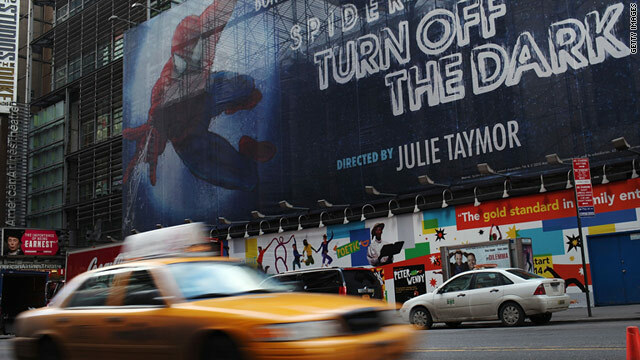 The Broadway musical, "Spider-Man: Turn Off The Dark," has been plagued by accidents and delays. (CNN) -- Producers of the injury-plagued "Spider-Man: Turn off the Dark" have replaced its director and pushed back the opening of the $65 million Broadway musical for a sixth time. The show, which was scheduled to open Tuesday, will now open in early summer, the show said Wednesday. The latest delay allows the expanded team to work on various revisions, including improving the musical arrangements and sound quality, producers said in a statement. "This amended schedule will allow the time necessary to execute the plan, which will include revisions to the script," the statement said. "The additional time commitment required by this new plan will make it impossible for director and co-book writer Julie Taymor to continue on in her day-to-day duties with the production." Producers said contrary to reports, "Taymor is not leaving" the creative team. "Her vision has been at the heart of this production since its inception and will continue to be so," they said. The delay is the latest in a string of setbacks for the web-slinging superhero, which is the most expensive musical in Broadway history. The March date was the result of another delay announced in January. The scheduled opening of February 7 was pushed back to allow for more time to "fine-tune aspects of the show, including the new ending," producers said in a statement at the time. Production of the musical featuring lots of aerial stunts has been beset by cast injuries and technical problems. In December, actor Christopher Tierney became the third performer to suffer an injury while wearing a Spidey mask (nine actors play the role of Spider-Man while he's in full superhero costume). The accident left him in serious condition, prompting producers to announce new safety measures. Earlier this year, an actress suffered a concussion offstage during the first preview night.